All major U.S. airlines are waiving change fees for fliers affected by Monday’s bombings at the Boston Marathon. A 27-year-old man whose legs were blown off by the Boston bombings reportedly helped FBI agents identify one of the suspects, saying the man looked him in the eye as he placed a bag filled with explosives at his feet. Amid the mundane chatter of an ordinary digital teenager, a Twitter account believed to belong to the Boston Marathon bombing suspect who was captured after eluding authorities on Friday contains some chilling chatter. In the tight rows of chairs stretched across the Commonwealth Ballroom, the nervousness — already dialed high by two bombs, three deaths and more than 72 hours without answers — ratcheted even higher. Federal investigators want to speak with the widow of Boston Marathon bombing suspect Tamerlan Tsarnaev, a Muslim convert and mother of their 3-year-old daughter, according to the Rhode Island woman’s attorney. A fund created to benefit the victims of last week's Boston Marathon bombings has generated $20 million, said state officials, who vowed to distribute the money by the Fourth of July. The father of the Boston Marathon bombing suspects has been interviewed by Russian and American authorities and will make his way to the United States along with his ex-wife as early as Thursday while more details emerge about the brothers' recent activities in the U.S., including word of where the deadly explosives may have been purchased and that the family relied on welfare for at least some of their time here. The surviving suspect in the Boston Marathon bombings has been moved from a civilian hospital to a Bureau of Prisons facility, a spokesman for the U.S. Marshals Service tells Fox News. Here in Boston, people will grieve for many days. How could anyone be so evil as to plant a bomb that would murder an 8-year-old child, rip the legs off parents and devastate a celebration of athletics that is pure joy. These were murders that wrench the soul. Investigators have pinpointed two men as "possible suspects" who were seen in images near the finish line of this week's Boston Marathon -- moments before twin bombs there exploded, killing three and injuring about 180 others -- a law enforcement official said. The second suspect in the Boston Marathon bombings was taken into custody Friday night, bringing to an end a massive manhunt in the tense Massachusetts capital worried by warnings the man was possibly armed with explosives. That didn't take long. For a moment, the manhunt into the Boston Marathon bombings seemed as if it would last a while. The first image the nation saw of the two brothers may serve as more than a pivotal clue to investigators in the Boston Marathon bombings. It is, perhaps, a snapshot of their relationship: One leads, the other follows. The widow of suspect Tamerlan Tsarnaev is "doing everything she can to assist with the investigation," of the Boston Marathon bombing, attorney Amato DeLuca said in a statement Tuesday. The surviving suspect in the Boston Marathon bombings has cited the U.S. wars in Afghanistan and Iraq as motivating factors behind last week's attack, a U.S. government official said Tuesday. There are many unanswered questions about the motivations of the alleged Boston Marathon bombers, Tamerlan Tsarnaev and Dzhokhar Tsarnaev. The past week has been a devastating one for many families. Zubeidat Tsarnaev's is one of them. 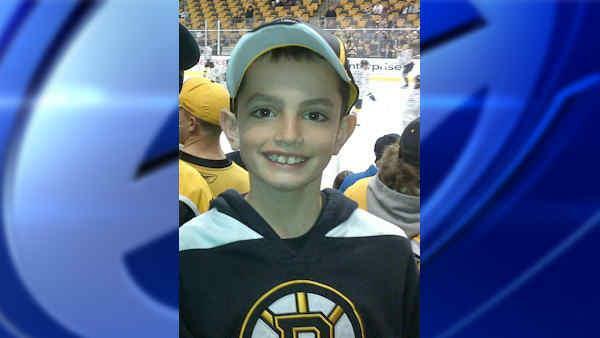 The FBI on Thursday asked for the public's help in locating two suspects in the Boston Marathon bombings case. Authorities have a clear image of a potential suspect in the Boston Marathon bombing, but they have not identified the suspect or indicated whether they know who the person is. Third-grader Martin Richard had just gotten ice cream and was near the Boston Marathon finish line, eagerly watching for friends to run by. The Chicago Police Department is sending a team of detectives to Boston to help investigate this week's bombings at the Boston Marathon. Boston Marathon bombing suspect Dzhokhar Tsarnaev lay hospitalized in serious condition under heavy guard Saturday - apparently in no shape to be interrogated - as investigators tried to establish the motive for the deadly attack and the scope of the plot. San Francisco Giants fans practiced a little patience on their way into AT&T Park this weekend. That's because security remains heightened in response to the Boston Marathon bombings. We spoke with one fan whose relative took a photo that helped track down the bombing suspects. The two brothers suspected of bombing the Boston Marathon appear to have been motivated by their religious faith but do not seem connected to any Muslim terrorist groups, U.S. officials said Monday after interrogating the severely wounded younger man. The Boston area held funerals for two more of its dead Tuesday - including an 8-year-old boy - as evidence mounted that the older Tsarnaev brother had embraced a radical, anti-American strain of Islam and was the driving force behind the Boston Marathon bombing. New information emerged Wednesday from U.S. officials that the name of one of the Boston Marathon bombing suspects had been added to a U.S. government terrorist database long before the explosions. 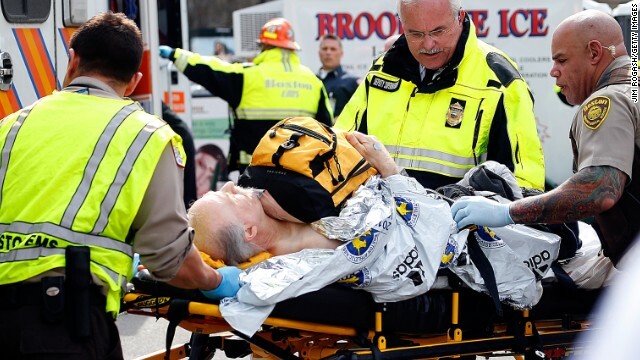 An investigation is under way after two explosions near the finishing line of the Boston Marathon left three people dead and at least 140 injured. Bombs that targeted the Boston Marathon on Monday may have been packed in pressure cookers, investigators say. 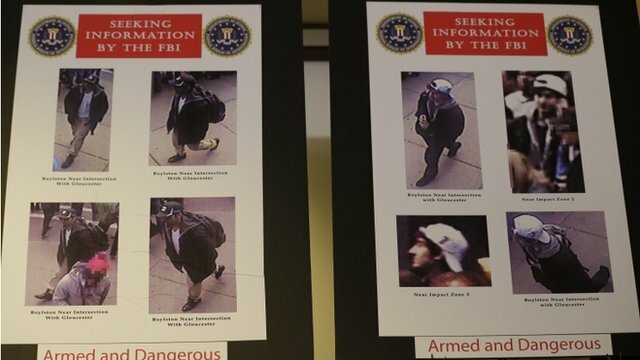 The FBI has released photos of two suspects it wants to identify as part of the investigation into Monday's Boston Marathon bombings. Police have captured the remaining suspect in the Boston Marathon bombings after a manhunt. The brothers suspected of bombing the Boston Marathon were probably planning further attacks, the city's police commissioner has said. The surviving suspect in the Boston Marathon bombings has been charged with using a weapon of mass destruction, the US Department of Justice says. US officials have travelled to the Russian republic of Dagestan to speak to the parents of the Boston Marathon bombing suspects. One of the Boston bomb suspects was added to a terrorism database 18 months ago at the request of the CIA, officials have told US media.